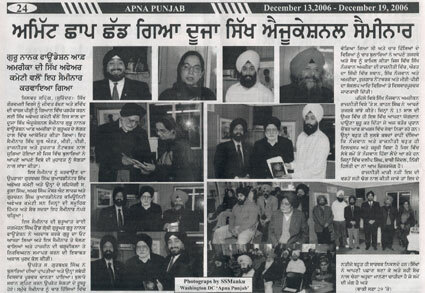 Weblog of Dashmesh Pictures [V.1.1]: Wow...hitting it "big time"
Shout out to the Apna Punjab weekly newspaper for covering the Education Seminar at Guru Nanak Foundation of America. Fellow speakers at this event included Kahan Singh Dhillon (President of Mount Vernon-Lee's Chaber of Commerce), Dr. Kamaljit Kaur Sethi (Host of The Sikh Program television show), Dr. Amarjit Singh (Editor in Chief of Chardi Kala newspaper and of the Khalistan Affairs Center), and your's truly. Man, my Grandmother is so proud since I've made it into a Punjabi newspaper. Cool!